The hazing by my high school friends for attending a Styx concert was inevitable. 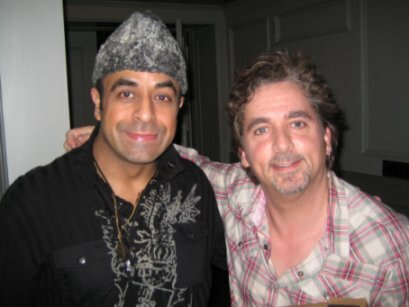 One friend stated, “Boy, Arash, I’m sorry. I feel for you. That must have been a brutal, awful night.” It was shocking to my friends that I would see Styx because even as early as age 14 I literally developed whiplash from head banging and carpal tunnel from overuse of the devil horns at metal concerts, and I clenched and drooled on Exodus’s Bonded by Blood (1985) and Slayer’s Reign in Blood (1986) records like makeshift pacifiers being suckled by a mentally underdeveloped child. 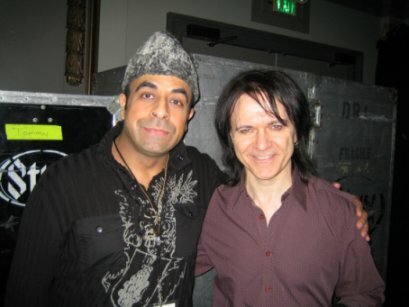 However, after accepting the invitation of Foreigner’s keyboardist, Michael Bluestein, and witnessing the great concert Foreigner put on in October 2009, I decided to become more open?minded about music, humbly accepting Lawrence Gowan’s (singer and keyboardist) invitation to see Styx. I am glad I did because before Styx reached the chorus of the first song, it was patently apparent to anyone in attendance, regardless of chromosome count, alcohol consumption level, or distraction by the presence of a nearby beautiful damsel, the band is a group of polished consummate professional musicians whose main objective is to deliver an entertaining show while having fun. 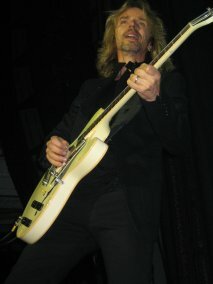 Styx started the concert, with no opening band, at 8:00 pm. The band played a 110?minute set from 8:00 to 9:50. The band played 16 songs (one in partial form) discussed in greater detail below. Admittedly, the review is long. 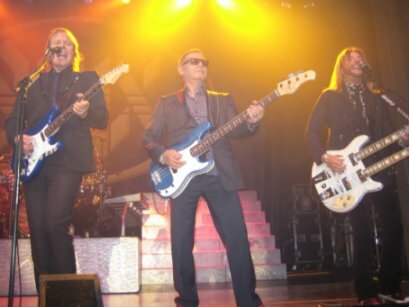 If you prefer a truncated review, please read the concert review in the local newspaper, where you will find the standard review by the “entertainment” journalist mentioning only Styx’s three most popular songs performed and containing numerous errors about band chronology as well as song and record titles. Such journalists are more interested in trying to look cool for the female fans in attendance and more preoccupied with the proper placement of ear plugs in their dainty ears to protect their frail hearing. 1. 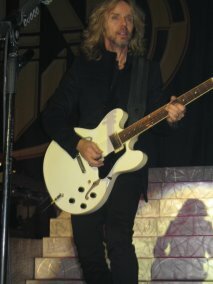 Fooling Yourself (The Angry Young Man) features a catchy chorus and a keyboard solo during which LG, who has a strong stage presence, rotated his single silver keyboard with a gold “Styx” logo 180 degrees and played part of the solo facing the crowd with his body stretched forward, and his hands nimbly hitting the ivory keyboard keys behind his back. 3. Too Much Time on My Hands (Paradise Theater, 1981). TSh handled lead vocals to this up tempo song with a catchy chorus. 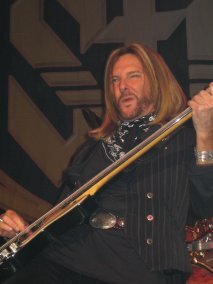 RP, who played a punchy bass line, was also finely dressed in a vertical?pin striped sleeveless wool blazer, long?sleeve black cotton shirt, black suede pants, black sneakers, and a black bandana with a white print around his neck. During the guitar solo, TSh, JY, and RP stood next to one another center stage and jammed. 4. 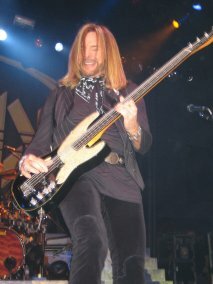 Lady (Styx II, 1973) is a sentimental ballad that featured LG on lead vocals. During the first 60 seconds, the spotlight shined on LG as he sang the soft introduction sitting behind his keyboard. After the 60?second introduction, the rest of the band joined in, transforming Lady to a powerful mid tempo song with heavy drum beats. Following the introduction, LG jumped off his keyboard riser and sand the remainder of the song walking around stage and up and down the two sets of pearl?colored steps (seven to be exact) positioned on each side of TSu’s drum set. 5. Lorelei (Equinox, 1975) is a mid tempo song with a soft tinge featuring prominent keyboards and JY on lead vocals. JY wore a black blazer with leather lapel trims, short-sleeve black cotton dress shirt, black wool slacks with satin vertical stripes and black button-sized studs on the outer sides, black leather shoes, and a thin navy blue tie. [At the risk of sounding like fashion critic Mr. Richard Blackwell, the combination of a short?sleeve shirt and a tie seemed at odds. It is the combination one would see worn by a member of the pocket protector brigade as he exits from his cubicle at Apple Computers on Friday night with his hair parted like the Red Sea and far fetched hopes of scoring with the ladies at the local eatery. Sadly, his only scoring will come when he returns home to his PlayStation.] Lorelei features a dual guitar solo by JY followed by TSh. 6. Snowblind (Paradise Theater, 1981) is a slow tempo rocker. JY sang the first verse and TSh picked up lead vocals beginning with the first chorus. TSh wore a black blazer, black t?shirt, black jean pants, and black combat boots. JY played a fiery solo on his blue Fender Stratocaster. 7. I Am the Walrus (The Beatles cover: Magical Mystery Tour, 1967) is cover song by The Beatles that LG sang at a high octave while sitting behind his keyboard. JY, TSh, and RP provided plenty of chorus “whoos” and encouraged the audience to clap and sing along. TSh played a brown Gretsch guitar. [Given TSh’s fairly small frame and the large size of his Gretsch guitar, TSh appeared to be strumming a stand up bass. As one female fan put it, “Tommy is so cute! I just want to pick him up, fold him up, and put him in my pocket.” She was correct. TSh’s stature and scruffy goatee made him look like a koala bear.] 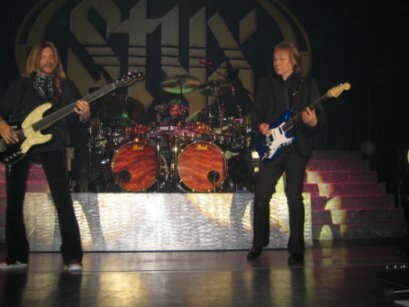 This song features heavy drums by TSu who played a large tobacco brown Pearl drum set with double bass drums perched atop a pearl-colored drum riser approximately two and one?half feet above stage and three feet in front of the “Styx” logo backdrop with a black background and yellow lettering. JY and TSh sang the fade out vocals. 8. Boat on the River (Cornerstone, 1979). Before the start of the next song, TSh asked the crowd, “It is working?” The audience response was a resounding yes. TSh stated, “I love this city.” He strapped on a mandolin and proceeded to sing Boat on the River, a folk song with depth and emotion reminiscent of Jethro Tull’s Aqualung (1971). JY played a tobacco sunburst acoustic guitar while TSu used mallets in lieu of drum sticks for a deeper richer sound. 9. A Criminal Mind (Gowan cover: Strange Animal, 1985) features a deceptive soft keyboard introduction by LG that he sang while playing his keyboard. The song meanders between LG’s atmospheric keyboard compared with JY’s brooding JY guitar riff and TSu’s heavy slow heavy drum beat. The song’s power and depth is reminiscent of Kiss’s I Still Love You from the Creatures of the Night record (1982), albeit with a slightly faster tempo. This was the most memorable song Styx played up until this part of the set, making it clear why it has been incorporated into the set list. 10. Suite Madame Blue (Equinox, 1975). 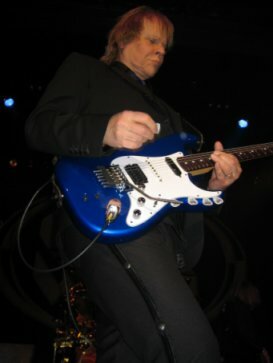 Before the start of the next song JY asked the audience whether they “will help Lawrence Gowan sing.” LG sang lead vocals without a keyboard accompaniment while sitting atop his keyboard. LG was aided by TSh’s 12-string electric guitar, RP’s bass line, and TSu’s light cymbal notes. Suite Madame Blue has a soft tinge for the first 2:00 minutes after which it transforms into a mid tempo power ballad with LG walking around stage singing with emotion. At approximately the 3:30 song mark, LG returned to his keyboard riser and played an atmospheric slow tempo 45?second keyboard piece reminiscent of Pink Floyd and Yes. At approximately the 4:20 song mark, JY kicked the song into up tempo mode. LG jumped stage front, JY played a fiery guitar riff on his brown Fender Stratocaster with plenty of left?hand vibrato, while TSh, TSu, and RP jammed along. 11. Crystal Ball (Crystal Ball, 1976). TSh introduced the next song as one the band “wrote in a rental car while going up and down the California coast.” TSh sang lead vocals and played a natural wood 12?string acoustic guitar. The spotlight shined on TSh as he sang the acoustic introduction. At the 1:40 song mark, the rest of the band joined in, transforming the song to a power ballad. 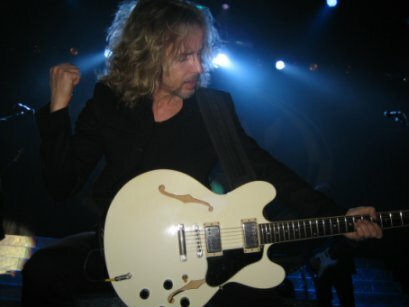 During LG’s keyboard solo, TSh went off stage and switched to a light brown electric guitar he used to play his solo. 12. Miss America (The Grand Illusion, 1977) is an up tempo song with a punchy bass line and driving drum beat. LG came stage front to encourage the audience to clap along while JY sang lead vocals. 14. Ruby Tuesday (The Rolling Stones cover: Between the Buttons, 1967). Before the next song, TSh commented, “We all sound great.” TSh was correct. 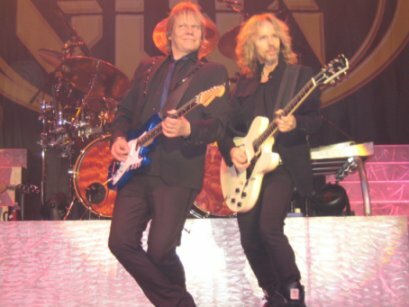 Like The Beatles and Kiss, Styx has the benefit of a band with multiple lead vocalists (e.g., The Beatles, Kiss), affording the band to write and perform a host of songs suited for varying vocal styles. TSh told a story about walking down Mason Street, a street in the theater district of downtown San Francisco. TSh asked, “Are my pants tight?” [In reality, TSh’s pants were not that tight. I was tempted to run up on stage next to TSh and turn around to reveal my behind to the shock of the audience, serving as a somber warning about the ill effects of too many cup cakes, and not of the female variety.] LG welcomed the audience to sing along and proudly took out a laminated lyric sheet for Ruby Tuesday. LG sang the first verse and chorus while sitting behind his keyboard. This song led straight into Come Sail Away. At approximately the 3:00 song mark LG performed a 80?second keyboard solo. Following LG’ keyboard solo, TSh, JY, RP, and CP stood next to one another center stage and jammed while TSu delivered a heavy drum pattern, LG ran around stage, and a fog machine emitted dry ice. During the latter part of the song, TSh came stage front, kneeled and asked a female fan in the front row to walk into the photo pit and strum his guitar. TSh nodded to motivate the fan to continue strumming for approximately 10 seconds. [The look of joy and … ahem … pleasure on the fan’s face indicated she fantasized about strumming a different “instrument,” one located on TSh’s person.] The band left the stage at 9:27 and returned in one minute to play one additional song. 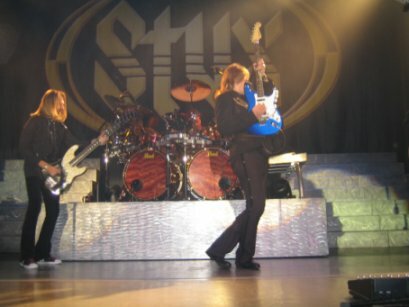 When the band returned on stage, they threw guitar picks, drum heads, and reusable black grocery bags featuring a white Styx logo into the crowd. 16. Renegade (Pieces of Eight, 1978) was performed as an entertaining 22?minute epic that began with a guitar duel between JY and TSh. TSh played a 15?second guitar solo. JY then motioned for TSh to get out of his way so he could step forward and shred. TSh followed JY by playing a second guitar solo. Finally, JY topped TSh with an impressive solo that prompted TSh to slightly kneel before JY and motion with his hands that he was bowing before the riffmeister. 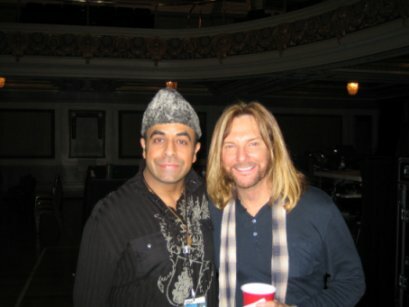 Styx then played Renegade. The song began as a soft ballad with TSh on lead vocals and then went into overdrive, featuring a catchy chorus. 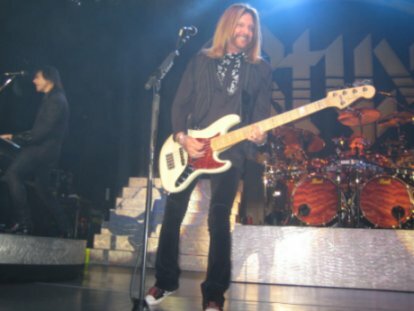 CP remained on stage as second bassist. TSh played the guitar solo after which, in mid?song, he individually introduced the band members. First, TSh introduced RP at which time LG came up to RP and took his photograph with a Polaroid instant camera. TSh then introduced LG who wrapped a belly dance hip scarf thrown on stage by a female fan around his waist and did an impromptu belly dance. TSh then introduced CP followed by TSu. TSu launched into an impressive two?minute drum solo. Finally, TSh introduced JY and said, “We call him the godfather.” TSh, JY, RP, and CP then came stage front, stood next to one another and jammed for two minutes. At the conclusion of Renegade, the band members left the stage but returned within one minute with black and white beach balls they kicked, threw and, in the case of LG, shot into the crowd using a hockey stick. Two flashback memories are worthy of mention. First, I recall being in middle school when Mr. Roboto from Kilroy was Here (1983) peaked at number three on the singles chart. A few of my yuppie classmates sat in the section of the cafeteria reserved for the “popular students.” These classmates were wearing their Izod shirts with collars raised and pastel?colored argyle sweaters draped over their backs with sleeves visible in criss cross patterns across their necks. Much to my annoyance, these classmates, who were sitting a few rows away, sang the chorus to Mr. Roboto at a loud volume and in a horrid pitch. I felt inclined to pick up the tater tots (i.e., side-dish made from deep-fried, grated potatoes) from my lunch tray and hurl them at their heads with great might, aiming for their foreheads with hopes the grease would make the tater tots stick and remain imbedded thereon, serving as makeshift bindis (i.e., small colored ornamental dots worn in the middle of a woman’s forehead, especially by the Hindu faith). However, I resisted the urge to prevent an automatic suspension by the principal. I then looked down and realized my anger has caused me to squish my tater tots, converting them to mash potato. Second, I recall walking into my older sister’s bedroom in the late 1970’s while she listened to Styx on her AM radio. She whistled the melody to “Come Sail Away.” I decided to join her by whistling to simulate the sound I imagined being made by the egg-shaped spacecraft that housed my Mork action figure. My sister had bought it for me based on her love for “Mork and Mindy,” an American sitcom starring Robin Williams, an alien who came to Earth from the planet Ork in a large egg-shaped spacecraft (1978-1982). I told my sister Mork’s spacecraft was capable of circling the moon. She was annoyed and scoffed. In a valiant effort to prove my point, I pulled my pajama pants down, turned so my tushie was facing my sister and lowered my hand containing the spacecraft, allowing it to make a semi?circle in front of my tushie. My sister, who was trying to enjoy her Suisse Mocha coffee, lost her appetite and swiftly grabbed the soft-ball sized spacecraft out of my hand. As I was fleeing I heard the spacecraft whizzing through the air like a whiffle ball hurled by my sister acting like an all?star baseball pitcher. When the spacecraft struck the back of my head I heard a “clunk” sound. To this day I am not sure if the hollow sound emanated from the hollow composition of my head or the spacecraft. Venue: the building that housed the original Regency Ballroom (“RB”), known as the Avalon Ballroom, was built in 1911. The Avalon Ballroom operated from 1966-68 and reopened in 2003 under its current name. 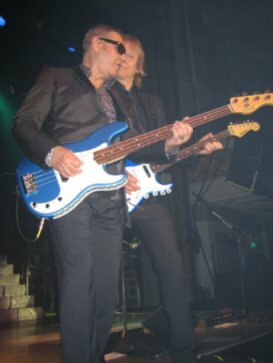 During the ballroom’s original stint in the 1960’s local bands such as Janis Joplin, Quicksilver Messenger Service, the Steve Miller Band, and Big Brother and the Holding Company performed at this venue. RB is a 1,050 seat capacity theater with a rectangular?shaped standing room floor measuring 96 by 69 feet with blonde hardwood floors and a permanent stage measuring 42 by 20 feet. Positioned 35 feet above the floor are 22 teardrop chandeliers circa 1900 secured on a roof adorned with gold medallions. RB has a horseshoe-shaped reserved seating balcony, the interior siding of which visible from the floor is virgin white. Four vertical white columns line the wall atop the stage and another six are present on each of the walls on the second floor. Also lining the side walls on each floor are six square?shaped gold?colored tapestries. 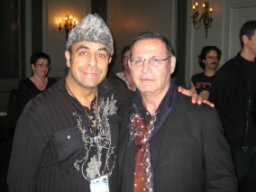 The concert was initially scheduled to take place at The Warfield Theater, a 2,500 seat capacity theater. However, due to low ticket sales partially attributed to a ticket price with a $50 face value, the concert was moved approximately five days beforehand to RB.